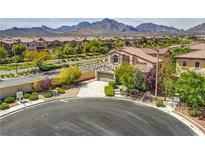 Below you can view all the homes for sale in the Solano At The Vistas subdivision located in Las Vegas Nevada. Listings in Solano At The Vistas are updated daily from data we receive from the Las Vegas multiple listing service. To learn more about any of these homes or to receive custom notifications when a new property is listed for sale in Solano At The Vistas, give us a call at 702-930-8014. *The Vistas 3bedrooms 2.5baths 2car garage*Gated community, culdesac lot*Rod iron entry*Front living space features wood floors,custom light fixtures/paint* Stone accents with arches* Family room/kitchen perfect for entertaining*Kitchen boast custom cabinets, granite counters,stone back splash*Upstairs has wood laminate floors ,master suite with coffered ceilings*Master bath has separate tub/shower*Secondary rooms are good size with ceiling fans* MLS#2087552. ERA Brokers Consolidated. Built Entertainment Center*beaufully Landscaped Front & Back W Large Sit In Type Gazebo In Back*5/1 Surround Sound Speaker System*ceiling Fans Throughout*vaulted Ceilings*upgrades Galore*natural Light Throughout*garage Storage MLS#2066210. Centennial Real Estate.